After school my big kids inhale snacks and are full of energy. We always play hard for at least 30 minutes after school and then my oldest (8) hunkers down and gets started with his homework. My oldest daughter (5) always begs me for homework too and her little brother (3) loves to join in. Typically for our afternoon preschool "homework" I get the kids moving and learning or working on fine motor skills often paired with some sort of literacy component. Today we decided to use some of the magazines we have lying around to create an alphabet wall. Our alphabet wall activity focused on letter names, sounds, beginning sounds, AND simple scissor skills. This activity was very simple and fun to do together. 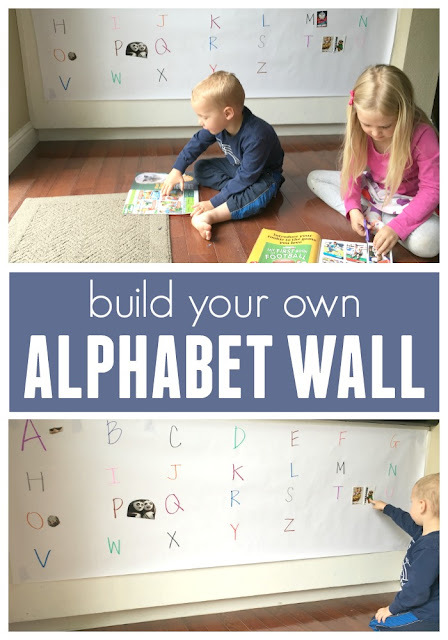 My son and daughter (ages 3 & 5) both know their alphabet letters pretty well and my daughter is pretty good at beginning sounds and cutting with scissors, so this activity got them working together. To get started I stuck a big piece of paper on the wall using painters tape. Then I wrote the entire alphabet on the wall using markers. Next I gave the kids magazines and had them look for their favorite pictures in the magazines. Once they found a few, we cut them out and talked about the words and what sounds they started with. Once the kids figured out the first sound in each word then they taped the pictures they cut out next to the corresponding letter that it started with! "A" had Alvin (from the Chipmunks) and "P" had pandas... and on and on. Eventually they filled up the entire alphabet. Some letters even got 3 or 4 pictures next to them! I think we're still looking for an X and a Z picture. While my 3-year-old hunted for pictures my 5-year-old was the scissors expert. Occasionally she needed help from me to cut something, but overall she did great. I love how magazines have some thin pages and some thicker pages (usually ads) so it was a great way for my daughter to work on cutting different types of paper. She usually hates cutting with scissors because her finger muscles aren't as strong as many kids her age, but she was having so much fun that she barely realized her muscles were working. You could also just use magazines and pieces of cardstock to make letter collages and turn them into a big alphabet book if you don't have any rolls of paper. 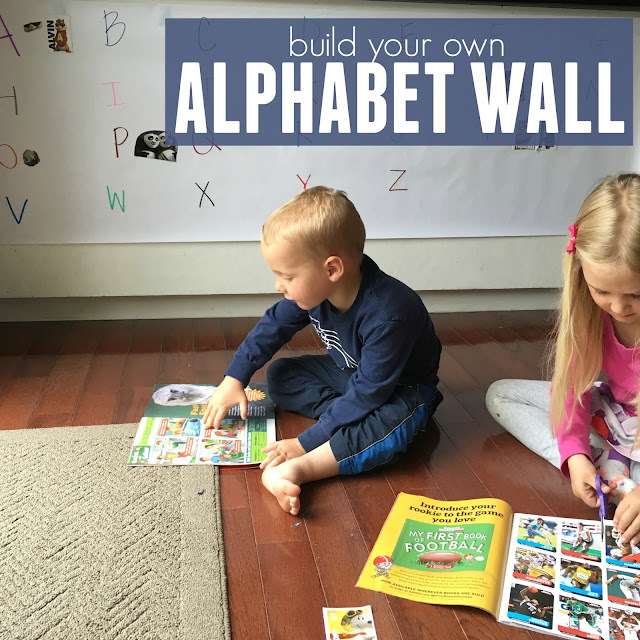 Do you have any other favorite simple alphabet activities you've tried out lately? 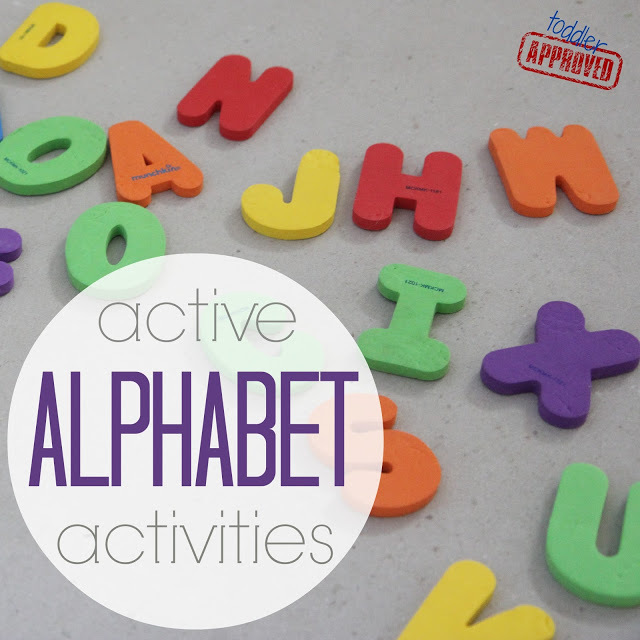 You can find some of our favorite alphabet activities in our Active Alphabet Activities post.